Accounts are used to allow FileMaker clients network access to a hosted CueChronicle project file. Four accounts are available; Super, Crew, Support, Guest. Each has a different level of access privileges. To allow remote access to your project at least one account must be enabled. If you are using FileMaker Server to host your file, enable the Super account befor you transfer the file to the server. The Super account should be reserved forÂ persons who need to administer passwords and accounts. To enable the Super account, click the check box shown below. The enter password dialog will open, setting a password is mandatory account. The Crew account is usually given to your clients that you want to have access to everything except Accounts administration. Set the check box to enable the account. 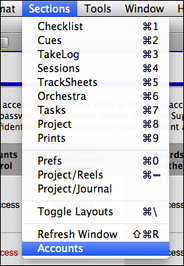 Allowing Cues to be deleted can be denied by setting the radio button below to No. The last two accounts Support and Guest, have less privileges, usually used for users that may not be fimiliar with CueChronicle and don't need to do much data entry. Refer your clients the topics under FAQ >Networking for instructions on how to log on.